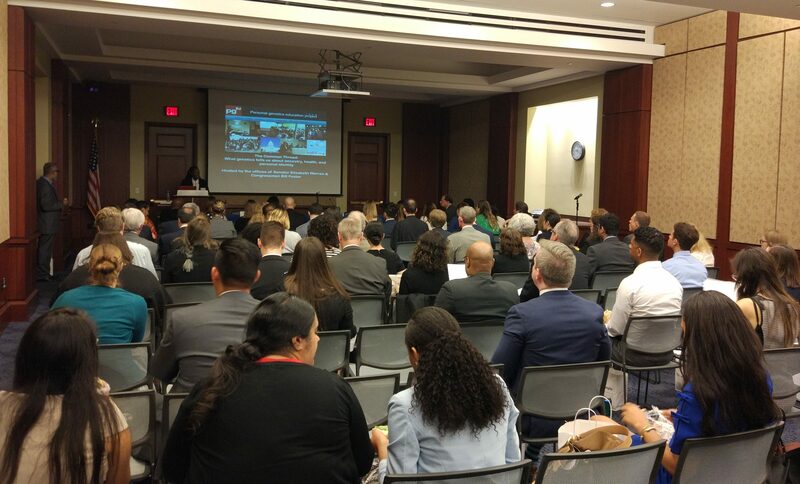 On May 15, pgEd returned to Capitol Hill to hold our sixth Congressional briefing. This continued our series of briefings to engage policymakers on the importance of education and society-wide conversations about the promises and implications of genetics. For the first time, pgEd held two programs back-to-back, one on the House of Representatives side of Congress, and the second one on the Senate side. 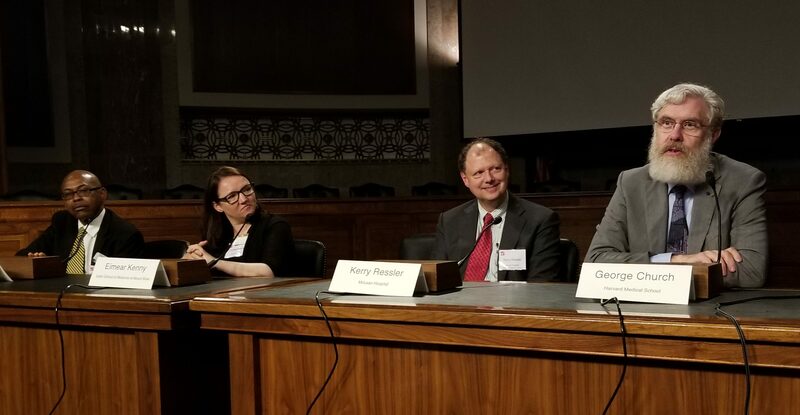 This briefing was focused on exploring how advances in genetics are producing new tools for investigating commonalities and differences across human populations, and their implications for precision medicine, racial identity, and beyond. Four expert scientists – Drs. Eimear Kenny, Charles Rotimi, Kerry Ressler and George Church – discussed how a person’s DNA, together with the environment, contributes to health, disease susceptibility, and response to medications. 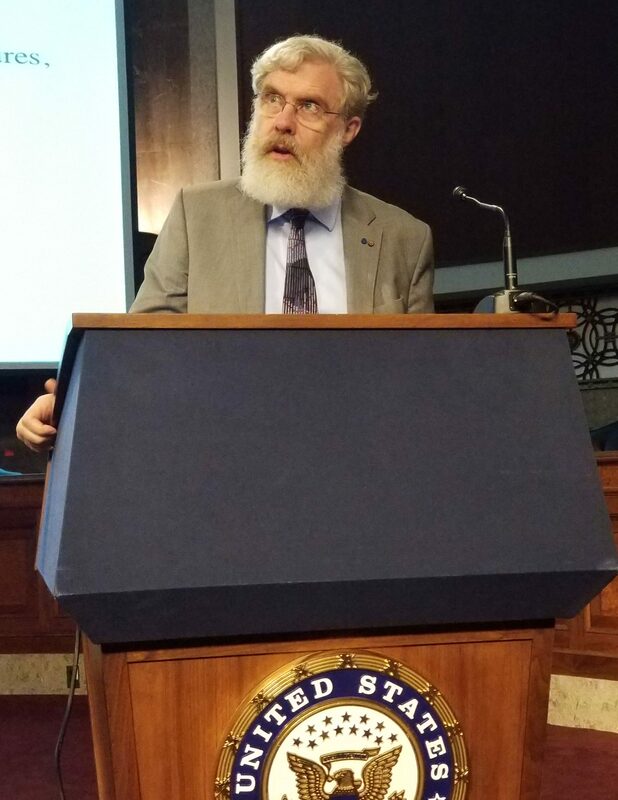 They also addressed misconceptions of genetic determinism, the profound impact of the environment (e.g., diet, living conditions, and life experiences),the history of eugenics, and the role of public awareness and dialog in the coming era of personal genetics and gene editing. 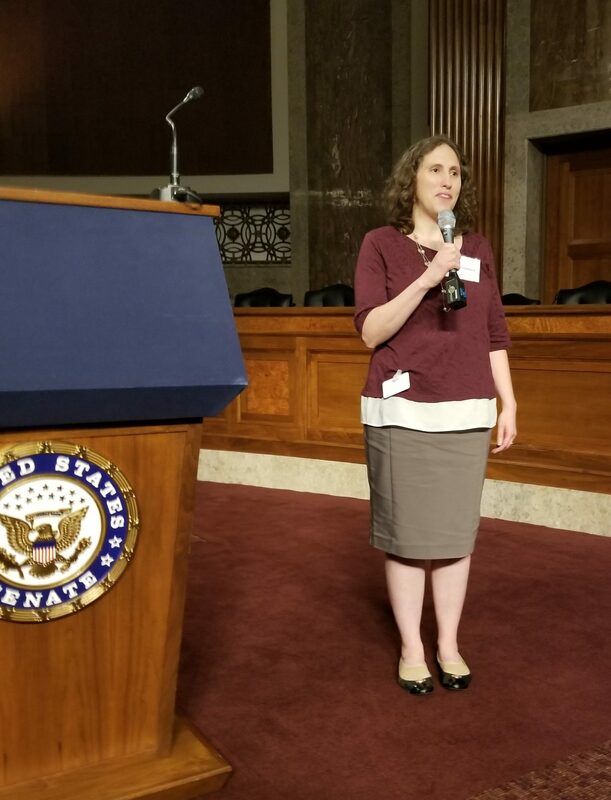 In total, the two programs were attended by more than 100 staffers from Congressional offices, various government departments and agencies, academic and professional societies, and members of the public. Also in the audience were Rahwa Abraham-Tesfay (Stanford University), Tsion Tesfaye (Carnegie Mellon University), and Drs. Dana Carroll (University of Utah), Mike Dougherty (University of Colorado), Susan Jenkins (Innovative Genomics Institute, University of California, Berkeley), Jenny Reardon (Science & Justice Research Center, University of California, Santa Cruz), Ronnie Stangler (University of Washington), Allison Werner-Lin (University of Pennsylvania), and Lea Witkowsky (Innovative Genomics Institute, University of California, Berkeley), who shared their expertise in genetics education and research, clinical practice, and the social sciences during the lively discussions throughout the briefing. 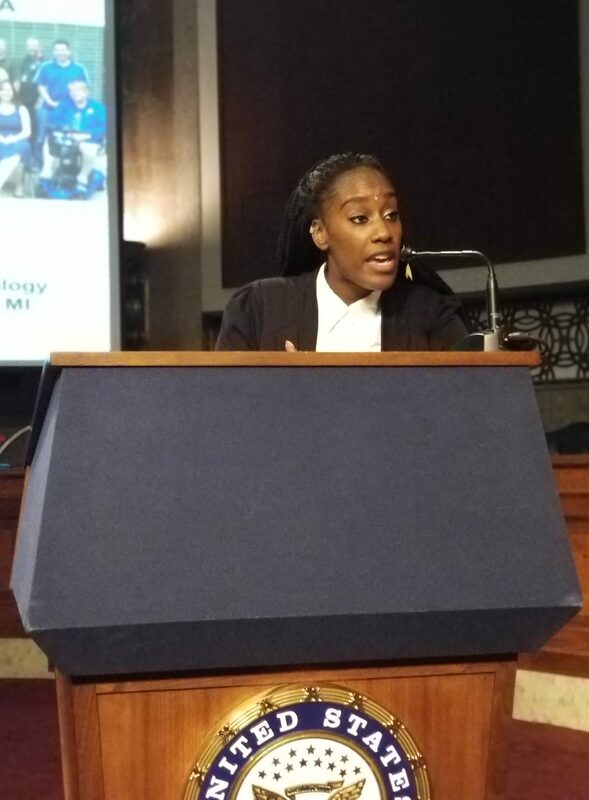 pgEd’s director of community engagement, Fabienne Mondesir, opened each of the two programs by introducing our mission – raising awareness and sparking conversation about the potential benefits and implications of personal genetics, striving to be inclusive of all voices in these discussions – as well as pgEd’s varied strategies, from curriculum writing and professional development for teachers, to community engagement and Congressional briefings. She also paid special tribute to Congresswoman Louise Slaughter (1929-2018), who was the first to welcome pgEd to the Hill in 2014 and hosted all five of our previous briefings. Her office was assisting with the planning of this program when the Congresswoman passed away earlier this year. Dr. Kenny gave the first scientific presentation, introducing the idea of using genetics to understand human ancestry and diversity, and how humanity’s current distribution of traits may be explained by historical migration and other population dynamics. She described the results from her recent work looking at the genetic basis of blonde hair in the Melanesian peoples in the South Pacific. The audience asked a variety of questions related to this research, including whether Dr. Kenny’s team found evidence for whether blondism in Melanesian populations were the result of selection (which means a trait becomes more widespread in a population due to providing some kind of reproductive advantage) or drift (a change due to random chance) – the researchers found no evidence for selective advantage, at least not in recent times. Another question concerns whether blonde hair could be linked to health-related traits, as in northern Europeans – not according to available results, according to Dr. Kenny, and she stressed how traits in different populations do not always have the same genetic relationships. Finally, a question was raised about the social implication of genetics research on a trait (such as blonde hair) that may carry social stigma or adulation – Dr. Kenny emphasized the need for geneticists to recognize the cultural significance of different traits (which may be different around the world), and to engage with local communities about why or how they want to understand a trait. The floor was then turned over to Dr. Rotimi, who discussed the importance of understanding ancestry to improve the health of diverse populations. By pointing out research studies showing that the majority of people have a mix of ancestries from many geographic areas, he emphasized how skin color or geography cannot be simply used to predict disease prevalence. Dr. Rotimi cited a few examples. Sickle cell disease, traditionally regarded as a “black” disease, is more commonly found among ethnic Greeks than South Africans or Mexicans. Tay-Sachs, found with high prevalence among Ashkenazi Jews, is also common among Irish people and French Canadians. Acute lymphoblastic leukemia, a childhood cancer that is highly treatable in industrialized countries, tends to have a higher relapse rate in people with high percentage of Native American ancestry regardless of whether the patient identifies as indigenous or white. And 40% of African Americans with kidney disease has a certain genetic variant in the APOL1 gene (which might have historically been protective against the parasite-carried disease, common in Africa, called sleeping sickness), but a high percentage of people identifying as Latino also carry this genetic variant. 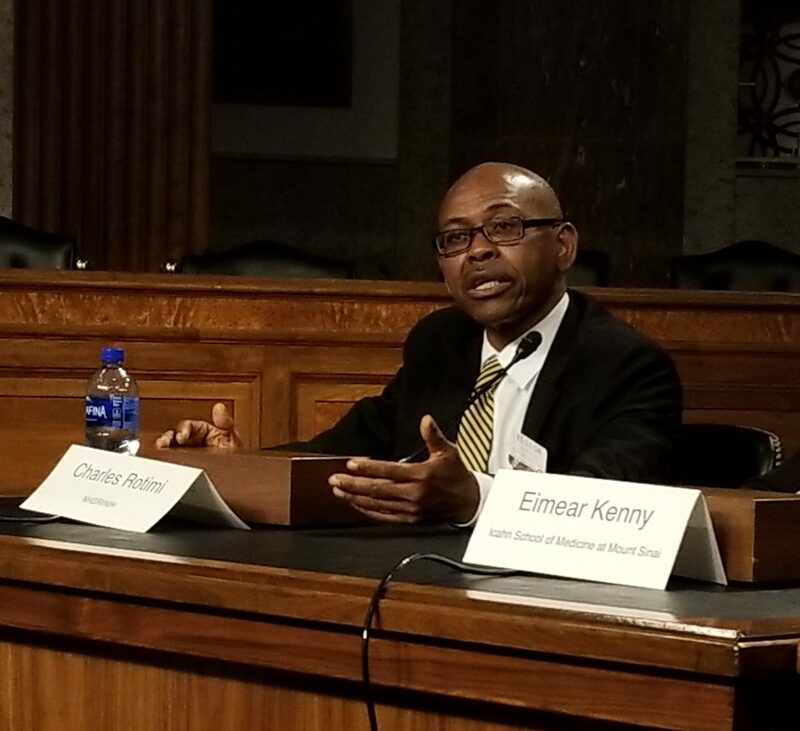 All in all, Dr. Rotimi pointed out that, as researchers develop new personalized or “precision” medicine, there is a need to capture the genetic variation from around the world’s diverse populations in order to ensure that “tomorrow’s medicine” works for all and won’t exacerbate health disparities. Next, Dr. Ressler explained how health isn’t all about genetics, but that there is also significant contribution from “epigenetics” – one definition of which is inheritance without alteration in an individual’s genetic code. 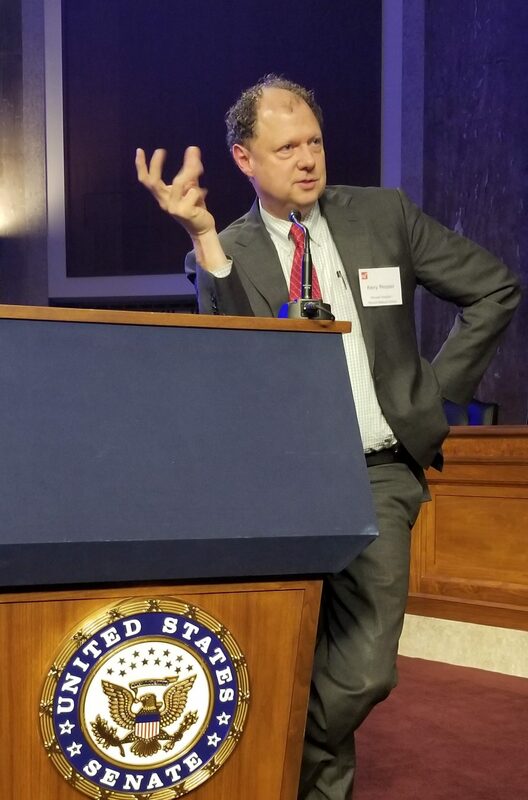 Dr. Ressler discussed how epigenetics maybe one pathway through which environmental factors, such as stress or trauma, exert their influence on health and disease. By conducting research on animals such as monkeys, scientists found that the offspring of maltreated mothers exhibit stronger stress response, even if they were raised by foster mothers that were not maltreated, and that this effect is passed on to the grandchildren. In humans, observational studies of Dutch families that underwent famine during Nazi occupation in World War II, the victims of the Holocaust, or inner-city African American communities all seem to suggest that stress and trauma may be inherited across multiple generations. Importantly, Dr. Ressler suggests that, because of this role of the environment, traits that had previously been regarded as biologically ingrained may actually be context-dependent and modifiable. It is important to keep in mind that not everyone who underwent the same environmental stress would end up developing the same effect. Moreover, in the same animal experiments cited earlier, transgenerational stress in grandchildren were reversed when the intervening generation was treated differently than the first generation, possibly suggesting that social, health and educational programs may similarly have a role to play in addressing intergenerational health issues. Dr. Ressler pointed out that it is no longer a question of “nature vs. nurture”, but the notion of “nature and nurture”. Finally, Dr. Church reviewed some of the past lessons we should learn from genetics, and looked forward to where the field is going. He briefly reviewed the history of the eugenics movement in the US, when factors such as class and race were used to judge whether certain people should be allowed to have children. 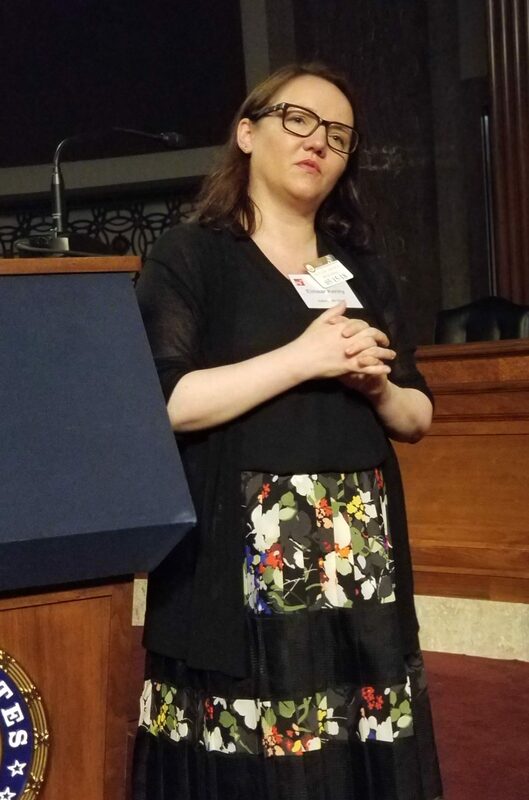 As the cost of sequencing a human genome decreased a million-fold over the past 15 years, and technologies such as genome editing continue to mature, Dr. Church implored the audience to think about some of the issues still to be addressed, including inequitable access. He cited the example of Tay-Sachs versus sickle cell disease – in both cases, that genetic cause of the condition is well known, but while the former is almost completely eliminated in Ashkenazi Jewish populations due to programs of screening and counseling, the latter still has a significant health burden on African American communities. Other issues to consider include how to avoid stigmatizing families who do not choose to undergo genetic screening (and perhaps one day, editing), whether to allow the use of editing to make genetic changes that will be passed to future generations, and how to address the issue of genetic information privacy for individuals who sequence their genomes. Following the presentations, in a panel discussion moderated by Dr. Marnie Gelbart (pgEd’s director of programs), audience members asked the panelists a variety of questions that speak to the broad implications of the topics discussed. For example, there were questions about how DNA data – along with our developing understanding of how genetic sequences are associated with physical traits – may be used for purposes beyond health, such as criminal investigations, and what policies should be in place regarding these applications. Others were interested in the role of healthcare professionals in the conversations about how genetics, ancestry and environmental factors influence health. Another question concerns how society could avoid an overemphasis on biological or genetic determinism in thinking about how traits and genetic variants are correlated; on this, the speakers agreed on the importance of encouraging an understanding of genetics that accounts for probability, complexity, and social context. 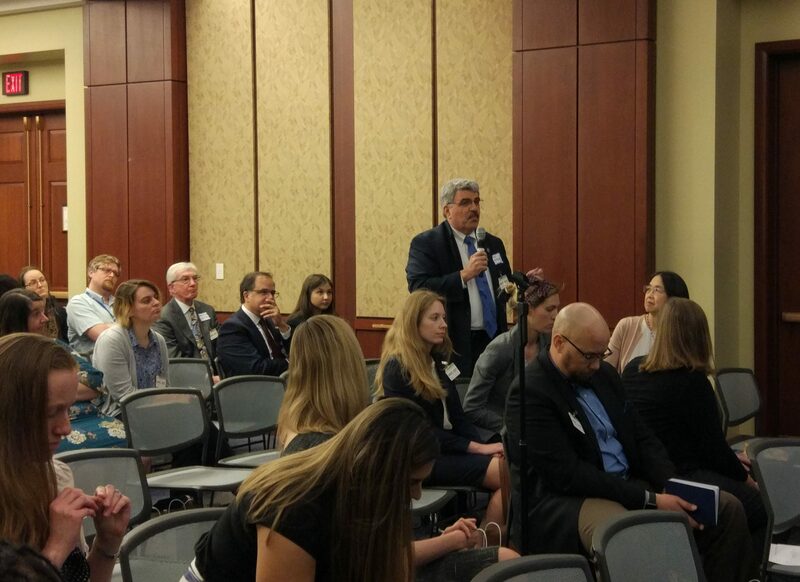 These and other questions only begin to scrape the surface of the promises and questions raised by ongoing advances in genetics, and pgEd looks forward to returning to Capitol Hill soon to continue these conversations. The mission of pgEd is to raise awareness of the benefits and implications of personal genetics. We aim to be inclusive of all voices in these discussions, regardless of socioeconomic or educational background, cultural or religious affiliation, and ethnic or personal identity. We strive to instill confidence in individuals to ask questions, make informed decisions, and respect the opinions of others.